Neo liberal, liberal, dictator, fascist, neo fascist, NGO agent, imperialist lackey are some of these devices that come handy and convenient to rapacious minds practicing the vocation of politics. We are also in the season of ‘common sense patriotism’ where history is commodified and marketed as ‘heritage’. The word ‘Liberal ‘was once an honourable word to describe those who put ‘liberty’ first. Today the word liberal indicates indecision, obstinacy and deceit. Meanwhile Prime Minister Ranil Wickremesinghe has discovered socialism. Inaugurating the medical faculty of the Sabaragamuwa University, he has said that real meaning of socialism was to allow people to climb up the social ladder, that the country’s education and health sectors should be effective to pave the way for people to do so. “There is nobody in this country who got rich on their own. Nobody. You built a factory out there – good for you. But I want to be clear. You moved your goods to market on roads the rest of us paid for. You hired workers the rest of us paid to educate. You were safe in your factory because of police forces and fire forces that the rest of us paid for. In the current firmament, Ranil Wickremesinghe and Gotabaya Rajapaksa stand out as two individuals who take the long view in politics and are quite adept at describing a spade as a compromise between a large spoon and a shovel. Both gentlemen possess remarkably common traits. Not content with rhetoric and they both demand results. They have little interest in short-term goals and are more focused on long-term results. They both prefer to operate with close advisors of their own selection. If we are to adopt the hurtful pastime of labelling and pigeonholing politicians one is an overt autocrat and the other is a covert autocrat. Readers are invited to take their pick. An anecdotal digression is in order. A day after watching the TV interview, this writer got into the elevator at the Liberty Plaza mall now in the same conglomerate that operates the TV channel. The elevator greeted me in an apologetic voice. “Sorry to have kept you waiting.” “I did not complain,” I responded. Getting off the elevator I heard the lady behind me telling her kid, “Eh minihata pissu!” Probably she was right. Worrying about liberal democracy and artificial intelligence in a land where my faith is declared the heritage of the rest of humanity is indeed enough grounds to go bonkers. That digression apart, what is bizarre and brazenly vulgar is the inclination of the liberal democratic state to permit privately-owned networks to discuss the defence of private property by private capital precisely at a time when nativist populists are driven to market a manufactured past by commodifying history and scriptural authority of a religion as a national heritage. And worse. They go pleading for universal endorsement of its capricious parochialism. We need a leadership and a movement that can capture the spirit of the time – the zeitgeist that prompted the millennials to defend democratic ideals at the Lipton Circus, Colpetty roundabout and the Independence Square following the 26 October obscenity. 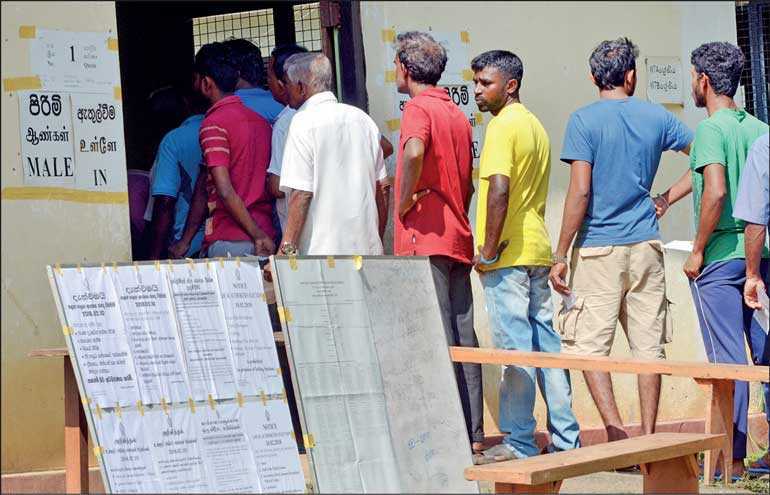 Mahinda Rajapaksa’s ‘Pansal Populism,’ Ranil Wickremesinghe’s ‘Pulpit Populism’ and Maithripala Sirisena’s ‘Village Upasaka Populism’ are all rooted in market economics where growth is pursued to enlarge the size of the cake. We cannot ignore what we are up against at this exceptional “populist moment”. It is time for a radical left response to the moral atrocity committed by the instigators of constitutional turmoil on 26 October. The continuing moral offense by Ranil Wickremesinghe who has failed to censure the transgression merely to remain in office to present a budget with incentives to win the next election also calls for a radical left response. We are angry, impassioned and confrontational. Watch Tissa Vitarana and Vasudeva Nanayakkara. Can the left be foggier than that? The refusal by the State to acknowledge the democratic character of demands by the wage-earning class makes it easier for Gotabaya and his troops to formulate their ambitions in xenophobic language. Our collective will must be harnessed to demand and achieve equality and social justice. Karl Marx’s theory of a perfect society envisaged unsubjugated, liberated working class. Stalin reneged. So, we have historical precedents in betraying, squandering historical opportunity. But just as Marxist theory paved way for social reforms and trade union rights our efforts succeeded in ensuring an independent Judiciary that helped us halt tyranny at its point of reincarnation. Our vision of a just society has allowed us to minimise injustice. Development according to Amartya Sen, must not be measured solely in terms of growth of gross national product. It must be assessed in the background of human contentment. The invisible hand of the free market must be regulated by the restraining hand of a social democratic order. We must understand human nature. When we grasp the reality of the acquisitive instincts of ‘capital’ we gain the courage and strength to remove what Karl Polyani called “removable injustices and unfreedoms”. It is a “spiritual and moral possession.” It is not just rules; it is a way of life. It encourages everybody to make the best of their capacities — holds that we have a moral responsibility to do so. It encourages the artist to seek beauty, the neighbour to seek community, the psychologist to seek perception, the scientist to seek truth. I ask the readers, should we declare Thomas Mann’s definition of democracy our national heritage?